Context: it’s everything, right? We so dislike our statements taken out of context. But what about our clothes? They make statements, too, and so do our accessories. The Harlot’s Progress, Plate 1. 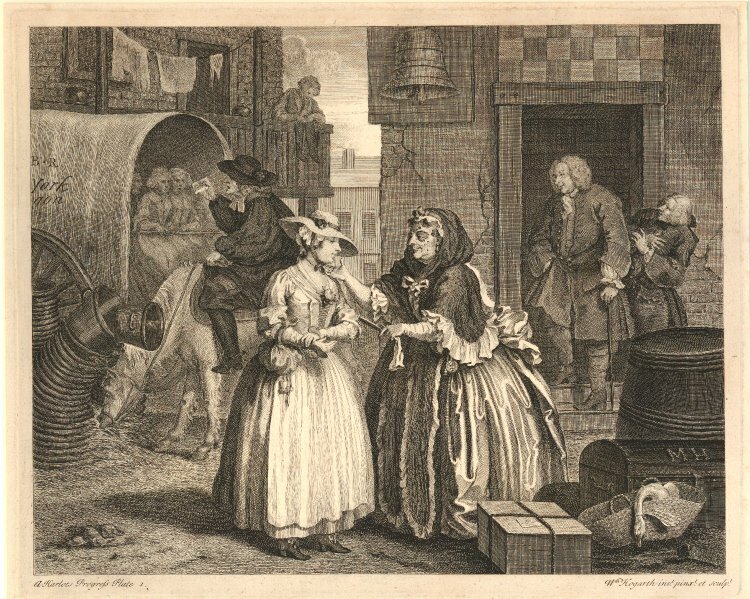 William Hogarth. Two images from 1740 to 1760 aren’t a lot of documentation to go on for 1775-1783, so I checked the Rhode Island newspapers for 1770-1790, searching for “basket.” No mention in ads, but “baskets of grapes” appeared in stories, and a mention of Chinese dogs in cotton-lined baskets (apparently the “basket dog” is the 18th century equivalent of today’s purse dog). As satisfying as basket-dogs might be, they’re not helpful in this instance. The Yale Center for British Art helpfully adds keywords or tags to their catalog records, which allows one to look for “basket.” Aside from The Farmer’s Return, this ovoid, market-basket form isn’t really seen. What is seen? For one thing, not many upper-class women carrying baskets, or any kind of burden or bundle. A woman carrying a kind of ovoid basket over her arm is shopping for food, not perambulating. In the most class-appropriate image, The Virtuous Comforted by Sympathy, the workbasket at the woman’s feet is a tidy, round form with a lid, more similar to Nantucket baskets* than to market baskets. It really doesn’t look like the kind of thing you’d leave home with. It’s a sewing basket. On balance, I think it appears that public basket carrying is more suited to carrying foodstuffs than personal items, and that the most common use of baskets in this period is to collect and carry food, whether from a greengrocer, fish stall, or gathering apples— at least if you are trying to be quite precise in the use of documented accessories. If you’re using a market basket to carry food, you do so knowing that it’s only (thus far) documented to England, and that the handles must be woven and not leather riveted to the side. The material from which the baskets are made is another question altogether, along with the proper woven form. As I noted to my friend, I don’t care that much. And why? Pockets, of course. My enormous pockets contain multitudes, sometimes even camera and water bottle along with wallet and phone, even if that much stuff distorts the line of my skirts somewhat. I can also fit my knitting in a pocket, and a slim, if dangerous novel (perhaps Moll Flanders). For carrying more than that, a wallet is probably best, or a cloth bag, or a portmanteau. But for a day in town, even if you’re a lady, you can carry quite as much in your pockets as I can as Bridget, though of course of a better quality. * I am not advocating carrying Nantucket baskets, to be quite clear. This post was much needed! Those (floppy) baskets (especially) bothered me. There are so many baskets being carried (of all kinds) that I really wondered about the prevalence and appropriateness of the various forms. I’ll happily relegate my floppy basket to floppy birds. The floppy baskets are at least better documented than some other kinds that reenactresses carry. I also had a basket that day, but it stayed in the car. I loaded up my pockets, which puts a strain on my arthritic spine, because I had wrestled with the same dilemma and had had to accept that a lady did not go promenading whilst visibly encumbered with anything heavier than her fan. It just ain’t elegant. No, it isn’t elegant. Such a dearth of servants in Boston of late, no? What you did manage to carry was quite intriguing! Seriously, though, I think documentation and sources for baskets and bags would be a good project (my list gets longer) and, too, that physical comfort is a factor. Hmm…more to look for! I wish 18th c fans had a ribbon to suspend them from the wrist; between the fan and the walking stick, my hands were full. If I could give you footmen, I would!